This following post and it's content is rated SAFE FOR WORK, and is viewable by any and all audiences and age-groups. "The National Defense Internet Highway System"
If you liked that, you'd also be interested in this also-safe-for-work video about 'Building The Pennsylvania Turnpike', viewing time is just over 23 minutes on this. There's even an abandoned section of the PA turnpike, which I may make a map out of one day, though it's out of the scope of the video (the tunnels are covered, the video predates any abandonment). These videos are just a little special treat for folks who subbed this thread / topic. I love old videos, and I do still learn things from them now and then. More updates may be posted tomorrow or Friday on this map (not 100% sure). Complete with sharp grade changes when going to enter/exit the tunnel, for a little extra airtime, and lots of extra fun / replay value. 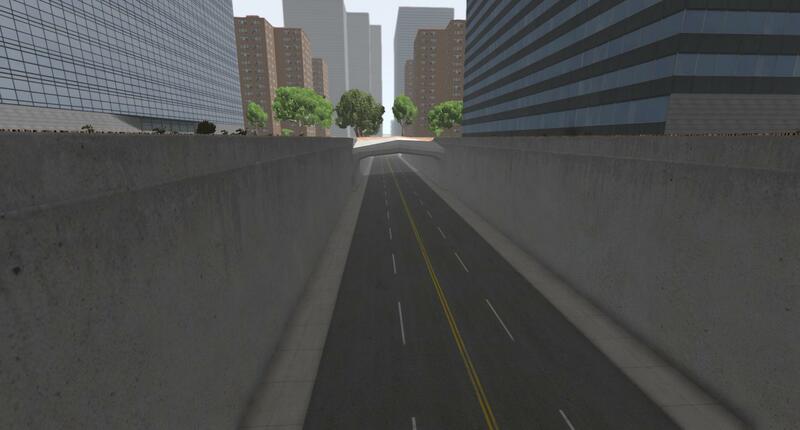 The tunnel WILL have AI in the next beta, as it mostly tunnels under mesh objects such as parking lots and roads. Very little is under actual 'terrain' only, allowing me the freedom to use decal roads on terrain lowered to tunnel-level in spots, without harming the surface. 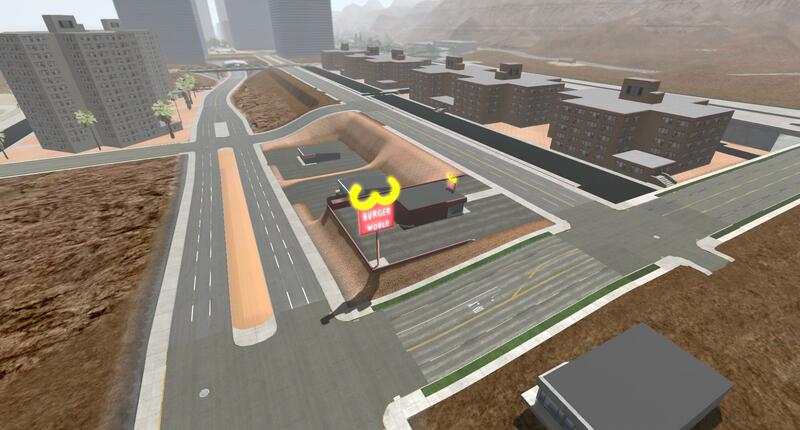 Second shot shows the position of the tunnel VS the spawn point (which is where the car is located under/near the Burger World red & yellow sign, just past the overpass carrying the highway). This above screenshot shows the open section of tunnel that's about 150 meters long or so, looking into the tunnel from it's other end. 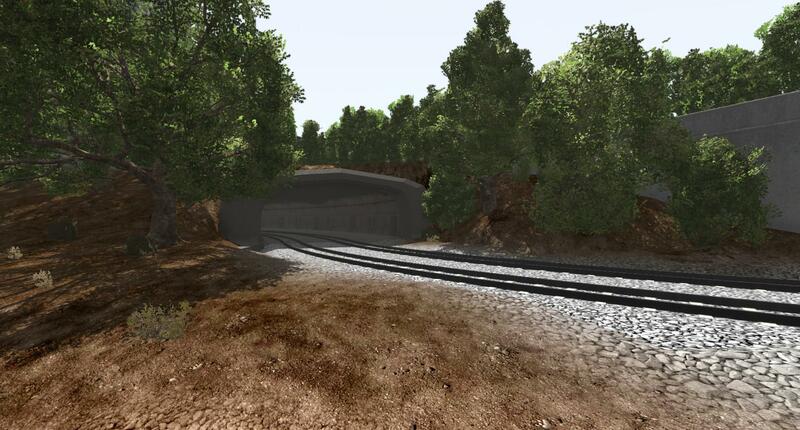 There will be a little more tunnel behind me (not built yet), before it becomes a surface road again. Tunnels and subway systems really add a lot of depth to the map and pack more fun (and road mileage) into the same amount of space. Much more fun to explore and find them, too. Building with this modular kit surely is quite fun though (and much less often do I lack a piece I do not have ready), and still easier than doing it in a modeling program. Since 0.14 game version, the performance hit from using many of the same modular objects doesn't really hit performance anymore, now that the objects batch-render much more readily. Also, collision is kept very simple, so it should offset any raise in draw calls to a point. 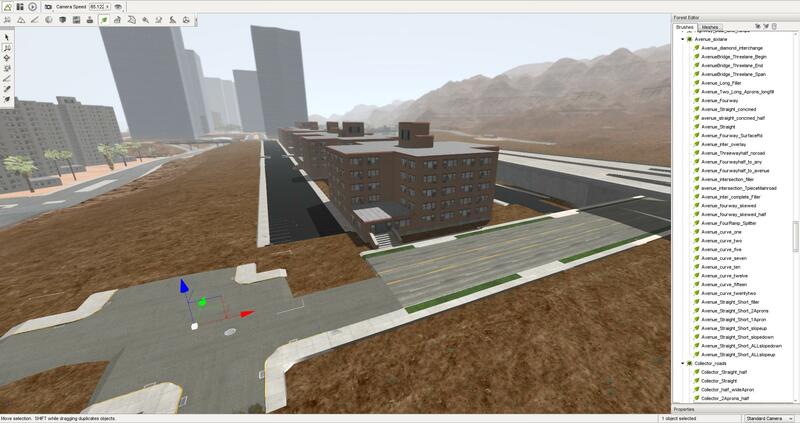 Lots are still very simple yet and not fully furnished, and the lot to the right far-side of the intersection is barely started at all. Textures are still missing reflections on buildings at this point. More progress tomorrow as I don't have other obligations, and it'll be randomly rainy for the next few days through the weekend. 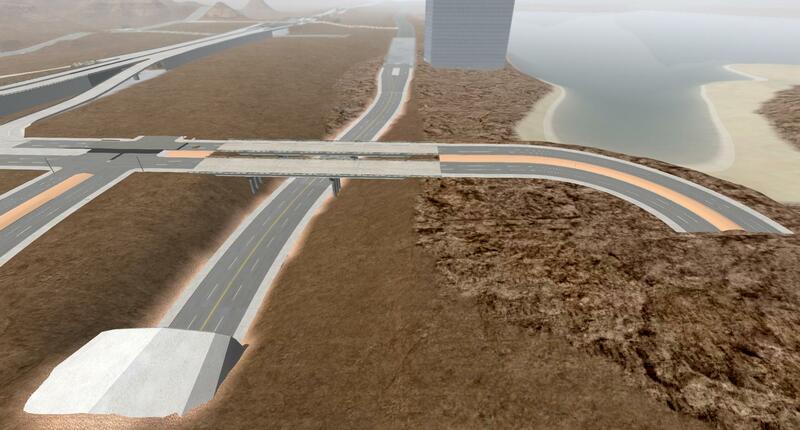 I was thinking that I would like to get a public copy of this map circulating when summer gets here, as it'll give people a chance to build with this Modular Road Kit over the summer - that's only two months away. 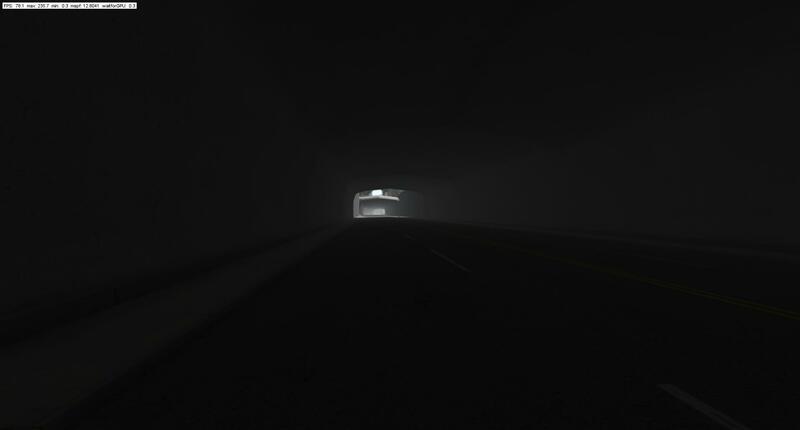 Finished building the stupid tunnel, and also 'zoned' it correctly so it has the echo effect and the darkness, too. It will have it's own lighting in due time if that doesn't hit FPS bad. 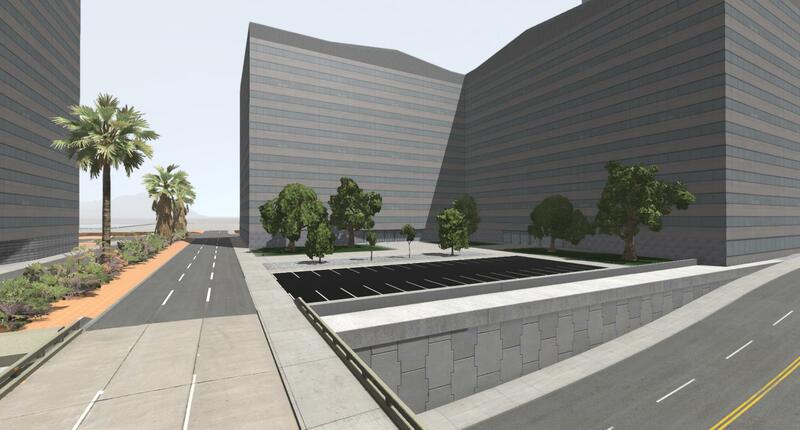 Another parking-deck has been added in here, to help with the parking situation. 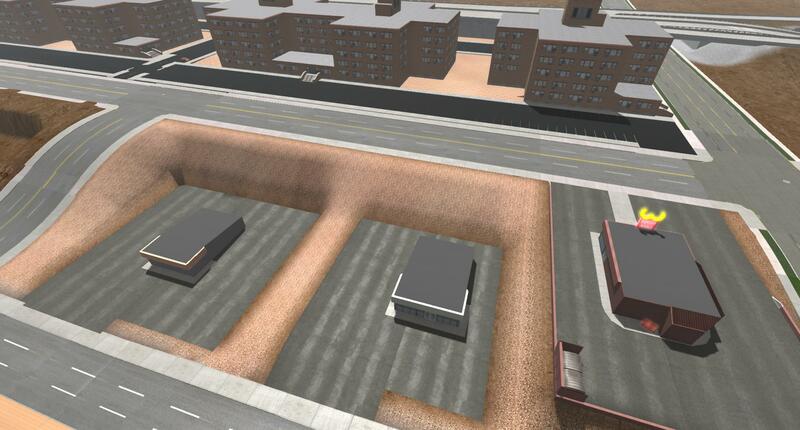 This open space between the buildings will have plants and possibly other small buildings taking up some of the space, though for obvious (subsidence) reasons, you can't build too close to the tunnel, except tall buildings who's foundation goes deeper than the tunnel, to bedrock. Will switch the tunnel walls to something with railings for also-should-be-obvious reasons later-on, likely post-beta unless I get them done sooner. Can you show the city from above (air)? 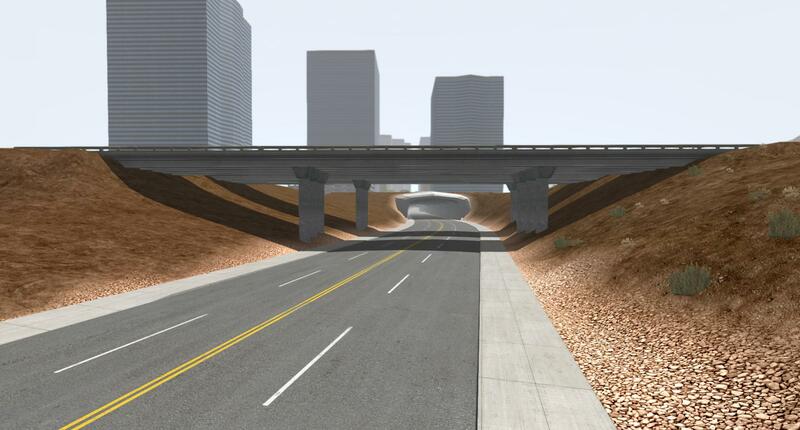 First, the new end of the tunnel that I finished building, I've been working on this all night and yesterday afternoon pretty much non-stop, and the bridge model is updated, too. 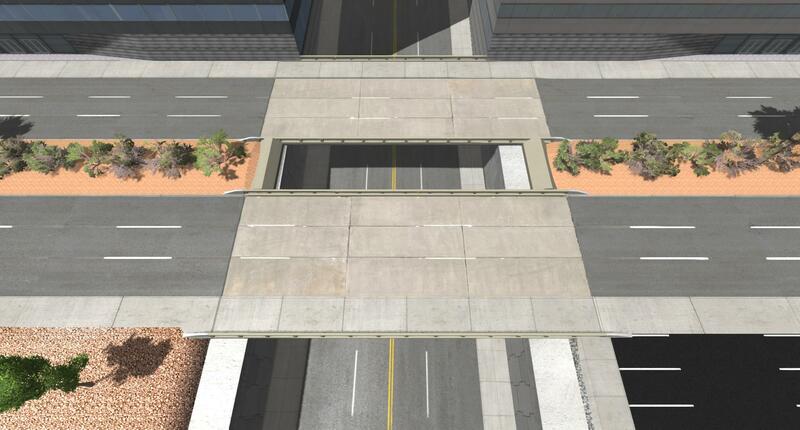 I adapted the existing newer highway 3-lane bridge to the avenues, moving the texture a bit and adding sidewalk *only on the most high-detail Level Of Detail*, so that the lower LOD's will batch with any nearby 3-lane highway bridges, rendering at the same time and not hitting FPS nearly as much. These will help FPS (not by a notable amount, being that I'm adding stuff), as the old model was not optimized at all and didn't even have LOD's. I hand-built that transition here out of objects I already had, and it came out pretty decent! 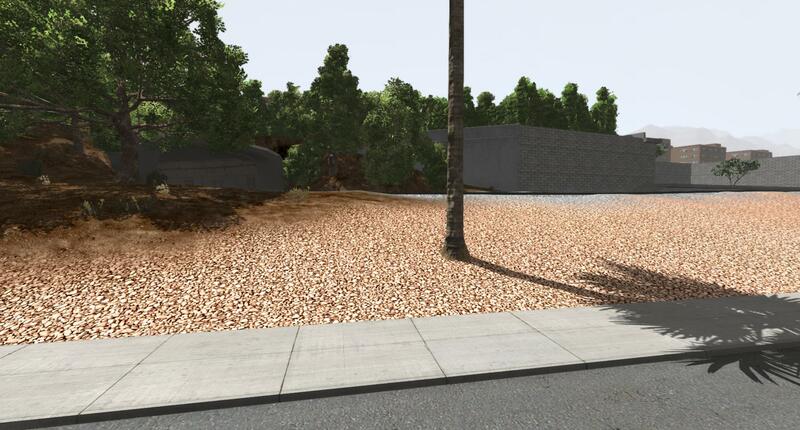 The ground around this portion will be lowered to sidewalk level and buildings will go here shortly, as will a parking-area for the beach (on the left, before the bridge). 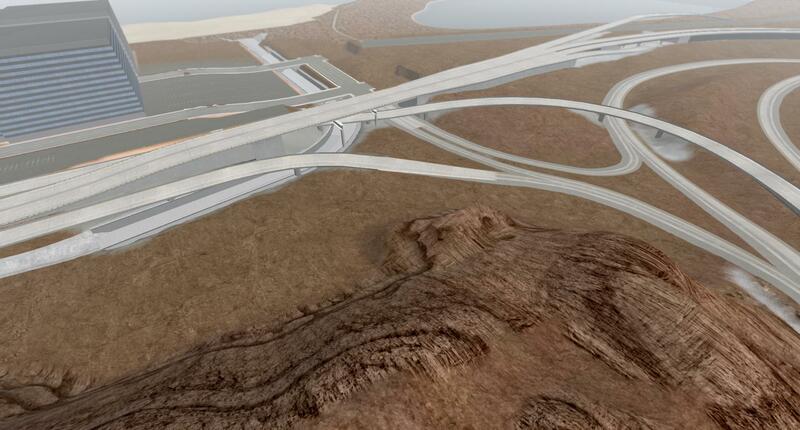 This shot shows all new stuff (the bridge, the road curve to the right of it, tunnel end and the road leading out of it), you can see where I'm going with this. 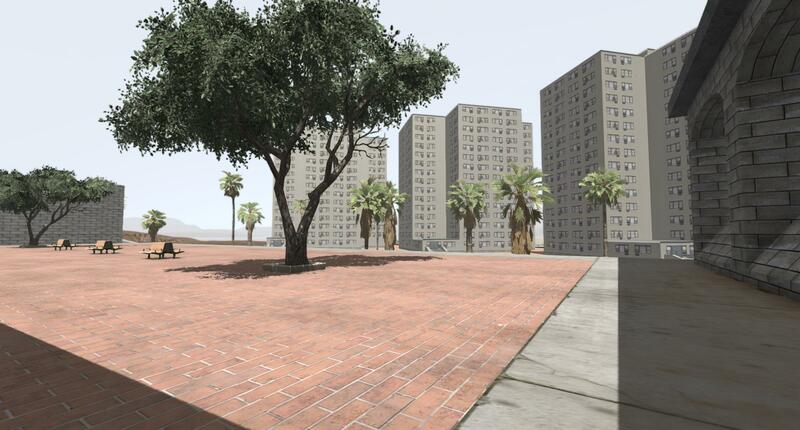 Also, that tall building in the shot above won't be where it is, in the next beta, it's just there temporarily. 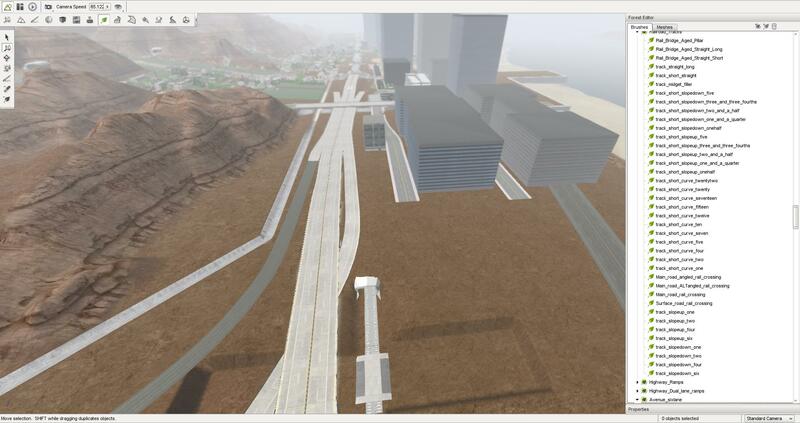 More roads will be in to the left of where the building is, and a 200~250 meter long bridge will be to the right of it. Definitely an improvement in quality, and takes <2.5% the CPU/GPU time of what the old one took, to render. 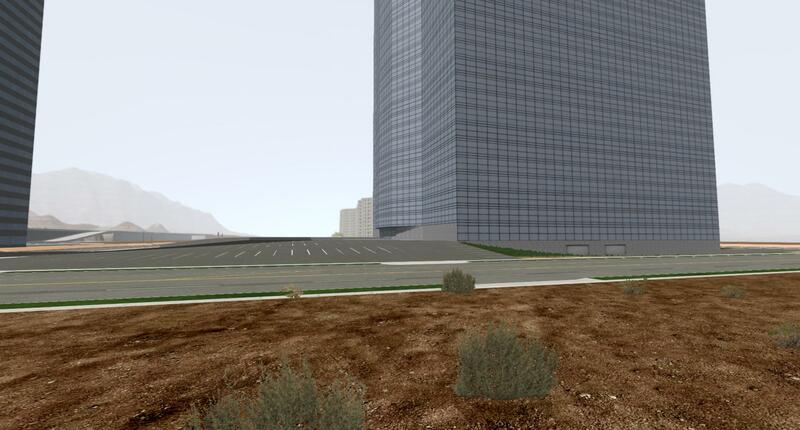 Above is a shot of much of the newer area (to the left of the highway), the second shot is taken from over the water, which you can see between the two tall buildings in the 1st shot. In the shot above, on the far side of the lake, you can just barely make out the tall skyscrapers in the two shots previous to this one. This side of the city has barely been touched, BUT, it will be worked on next week a bit. 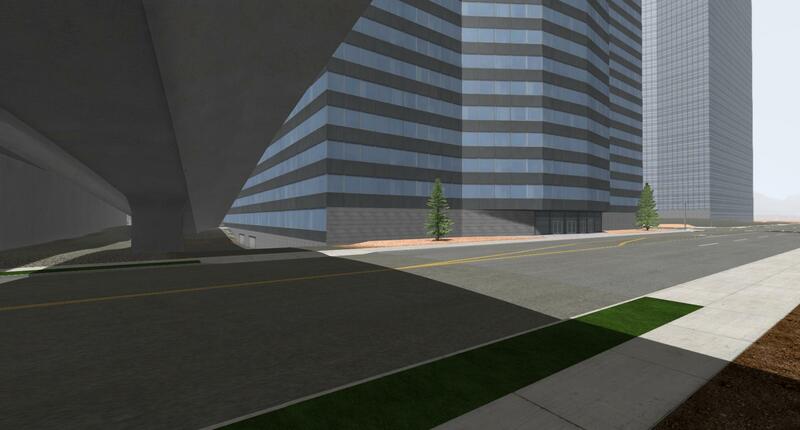 This side of the map might have even MORE tall buildings then the side I've spent most of this week showing you. I spent all night working on this, it's definitely going to need roughly another 8~10 full nights (2~3 nights worth of that I'll be meddling with AI) before I get a beta out for the Patreon crowd, but it will be worth the wait; with plenty of new content and places to drive, jump, and/or crash. I'm pretty sure this is a highway right ? Also, will there be an part a few miles away from the main city center ? Yes, my thoughts 100%, this is way overdue, but at-least I got this far on it! The best part is that all these road pieces (the Modular Road Kit) will let anyone build a road-network like this map has. 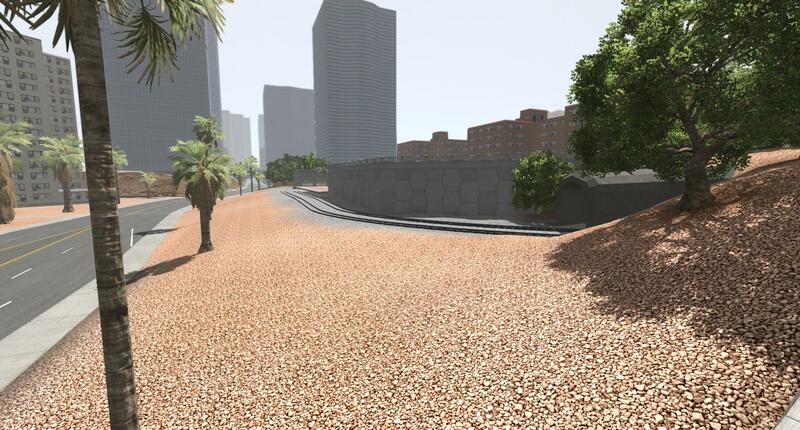 The point of the entire project is to make city-building accessible to anyone with editor knowledge. Yes, it will not only take a few miles of driving to get from one end of the CITY to the other, it'll also have rural AND mountainous parts that's outside of the city limits itself MILES away. You have to drive about 8~10 miles to get to the airfield at the one corner of the map furthest from the spawn point (which is not at any edge, more in the center area of the map), but it's not a direct line. To give an idea, if you stood at one end of the map and looked back in towards the center of the map, you'd only see 20% of the way across the entire map before stuff is completely hidden by fog. The fog amount may change at a later date, but for now it's pretty accurate. The fog is only so that FPS doesn't tank miserably, which I will adjust as-needed if I have extra FPS cushion (or deficit), though I'd hate to have to make the map more foggy. Oh, and there will eventually be some outlying homes and small towns in the more distant future. The map performance goal is 60fps with basic reflections only, full shadows, grass & SSAO enabled, and high-detail textures (with full collision enabled), on my RX 480 8gb which is mostly a stock card aside of a non-reference cooler with a 4790k i7 processor. It could go a few FPS below that in some spots, but performance should stay AT LEAST as good as 'West Coast USA' has. --I hope that answers questions. Can't wait to approach the city, watching the skyline appear and drive through it on the highways.....at night! Awesome. 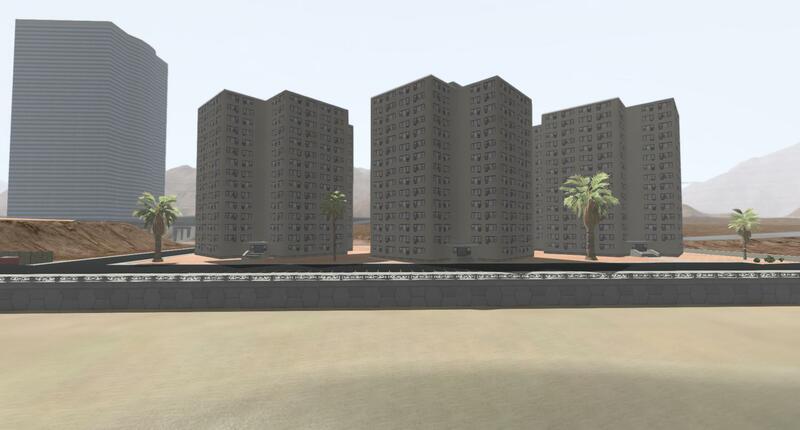 Those new buildings look beautiful - if they look similar to another residential building, that's because it is - it's a re-skin (there's 3 variations besides the main red-brick one). 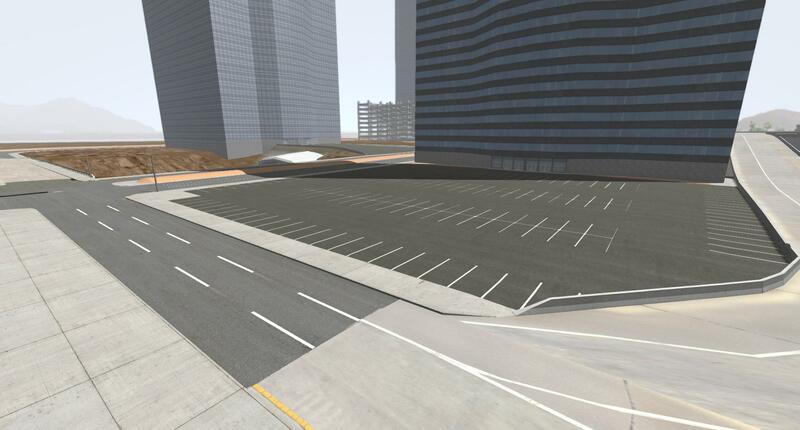 Two new parking-lots for the office buildings, obviously quite small, there will be a much larger parking-garage later-on nearby, dwarfing the "tiny" 9-floor parking thing nearby. 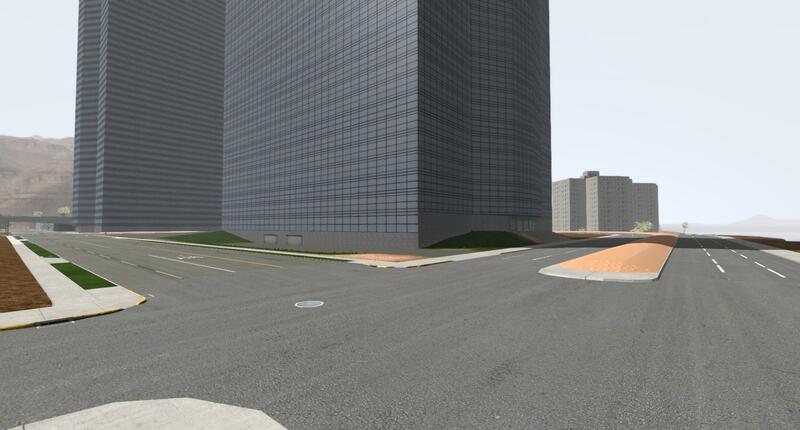 There's also two loading/unloading areas for the large buildings, as obviously would happen often with such a large building so you'd want separate areas for it. Two far-off* shots showing a wide angle of what the city is becoming. Yes it's finally starting to become a city now, the only person who's happier than you folks is ME, because it felt like eternity to get here. In one more month it will have been ONE YEAR since I began learning how to model objects inside Maya software. It was shortly then-on I started working on this stuff (about two months short of a year of work on this). As stated before though, the more stuff I make, the faster it goes/ seems to go. *note that, when you're far away (a half a mile or more) some objects such as roads will completely disappear, that's intentional, as I can keep the illusion of a road by just coloring the terrain accordingly, it won't make a difference at that distance anyways. This keeps draw calls down and performance UP - important. 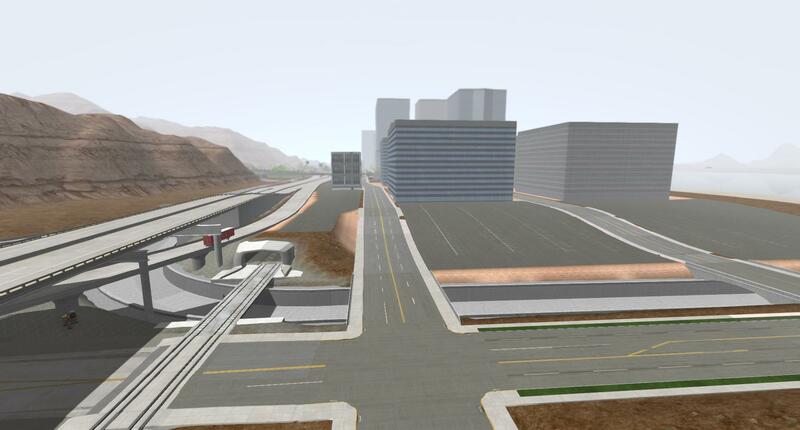 After I've got a few more lots finished up, a few more built/started, I will start on the AI work and get it moderately functional / tolerable / fix wrong-way vehicles etc for use with the Traffic Tool. 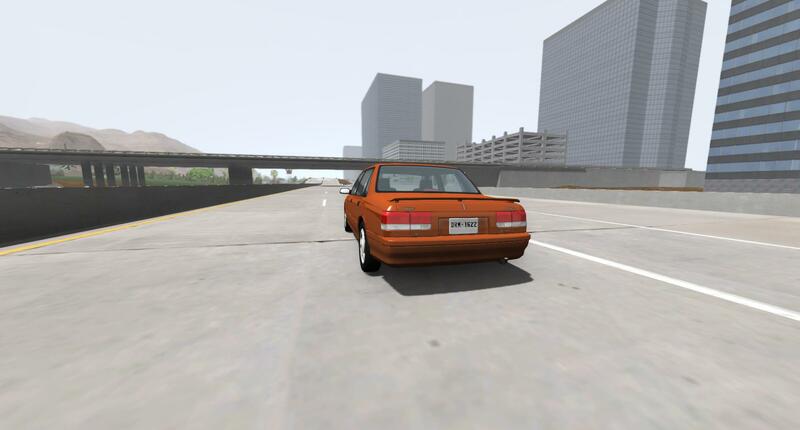 AI will NOT be perfect in the next Patreon Beta, but it will be much better than it is currently and hopefully less cars get stuck in roads or drive wrong ways etc. 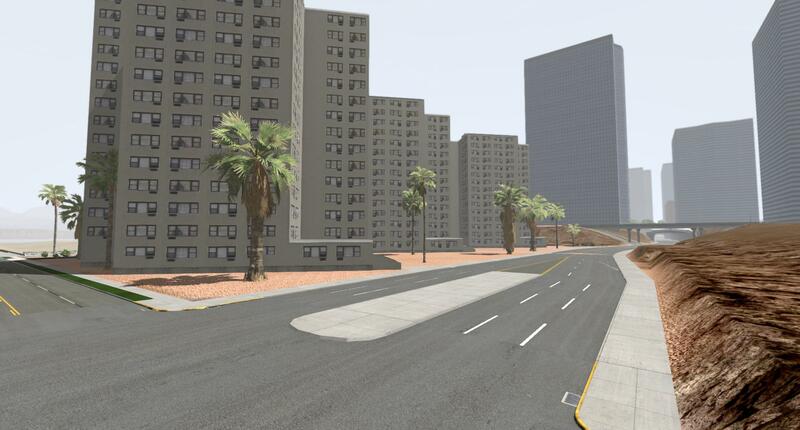 Im kind of getting vegas vibes from this, so it needs some casinos. and some neons. Saaame. Is there a possibility you could add an entertainment district??? Yes I will have neon stuff near a lot of retail with some hotel/casino buildings at some point. Yes; as above, do plan on doing something like that not too terribly far from where I want to put the airport in at (read: that's not the airstrip / base that's somewhat already started, this is a different airport, a civilian one). Part of the pro-bono to these threads, is that I can get input and feedback and get everything straightened out while it's being built. 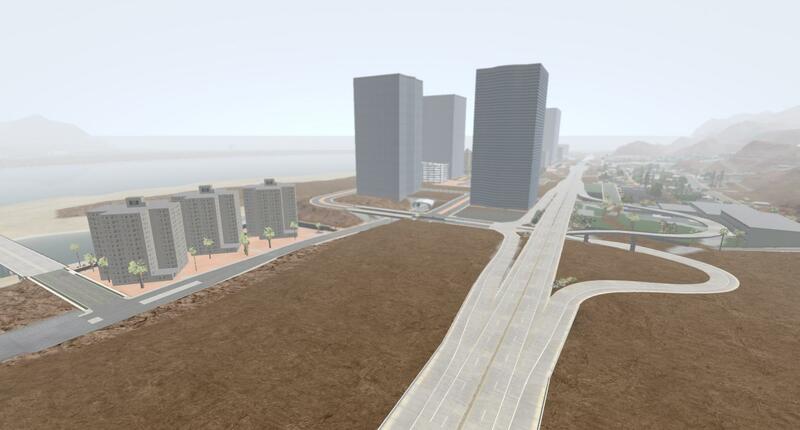 So that it's a map for all to enjoy without it missing anything that I can possibly think of a way to cram into it - as, for example: it's too late to put in an airport when you've already built a residential district somewhere, etc. I have a fairly loose plan where everything is going to go thus-far. Super-duper drowsy today when I shouldn't be, think it's the weather ( just want to sleep...). Might not get that much done today but there are some odds & ends to tie up I might be able to do, lest I fall asleep and be up all night editing again. Just so everyone knows, the next beta is less than 10 days away, I would prefer to release this about one week from now but there's still much work ahead. I don't know how long the AI work will take, it will take several days minimum. Positioning half an intersection. This is the editor interface, with the modular road kit. It's like those LEGO (tm) base-plates that you built everything on, but these all line up, the only limit is pretty much your imagination - and mostly right-angle intersections. In about 2~3 months or less, you'll be able to work with this kit yourself, as it will be released in it's entirety. The brick boxes there in the shot are 5-floor variations of the 15-floor Frederick Douglas towers, so if they look familiar, that's because they are - there will be a few different variations of these as is common in the real-world. Ever drive across town and see literally the same building on the other side of town? Same builder, same architect, this happens quite often and sometimes goes on for TEN years, that they'll go ham & spam out the same stinkin' house or building. Looks like JUNE/JULY will be the time I release a beta publicly, though there will still be much, much more regular updates for Patreon folks. 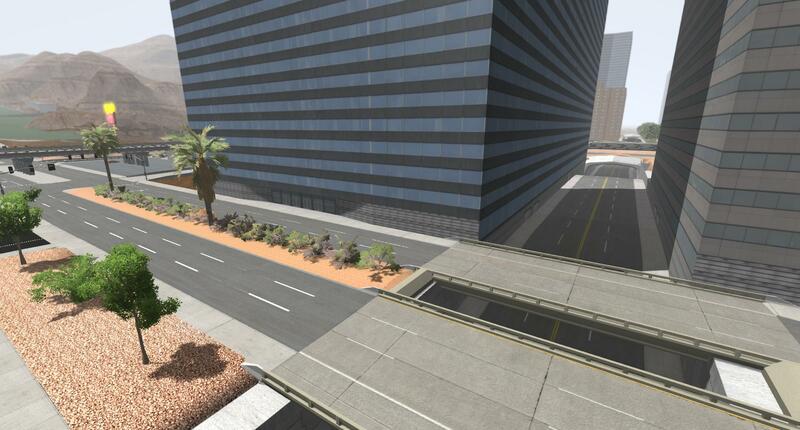 Nevada Interstate is getting a few days of work after the Patreon Beta for THIS map ships. As-always, Patreons will get Nevada's beta early, too. 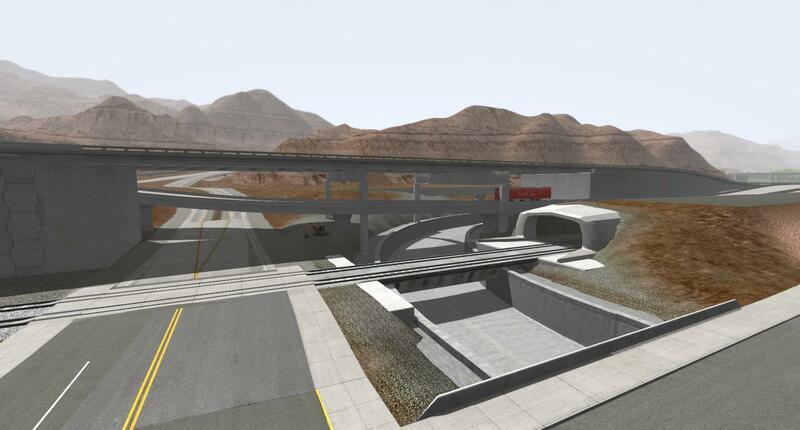 Nevada will get new bridges + AI tweaks. 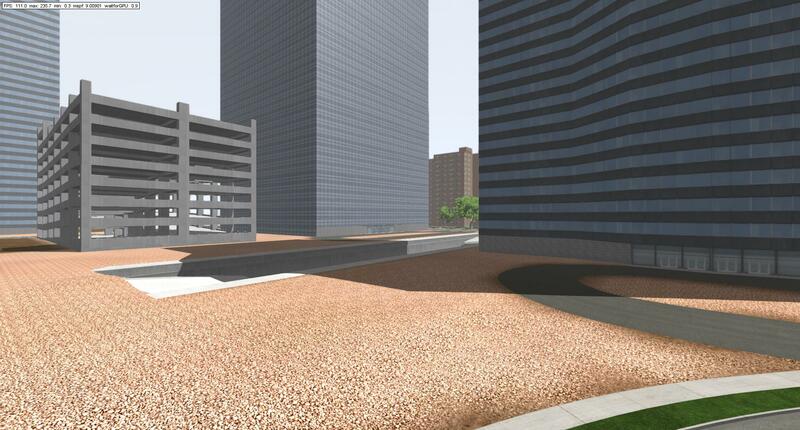 None of the buildings will be updated as-is the current plan. 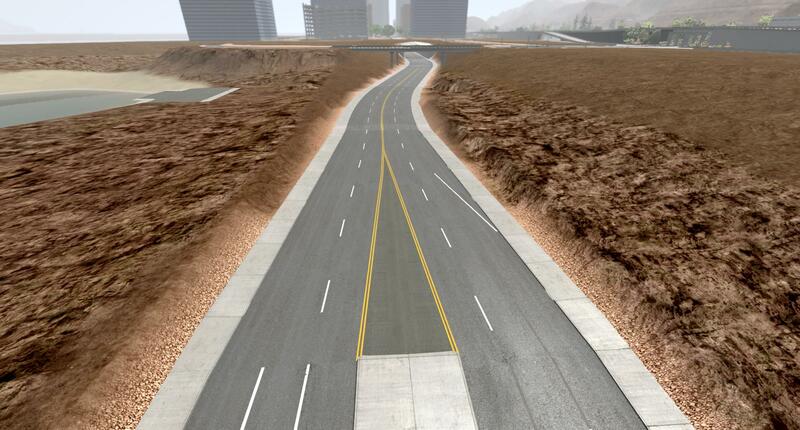 I have 3~10 days of work on Nevada Interstate. 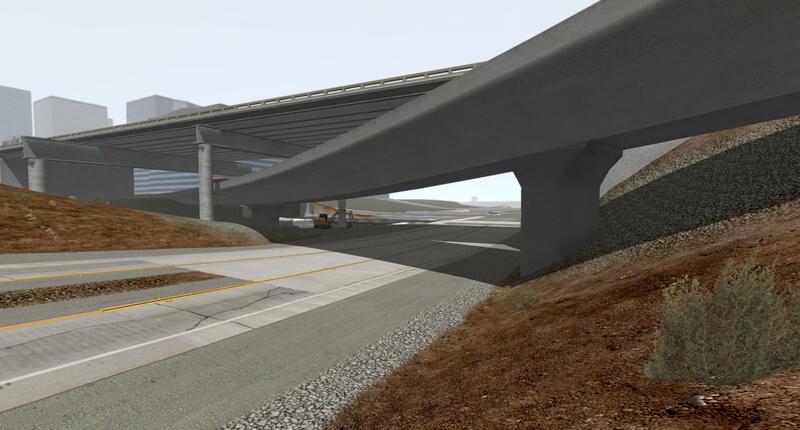 Textures won't be updated, except what's needed for bridges to work. 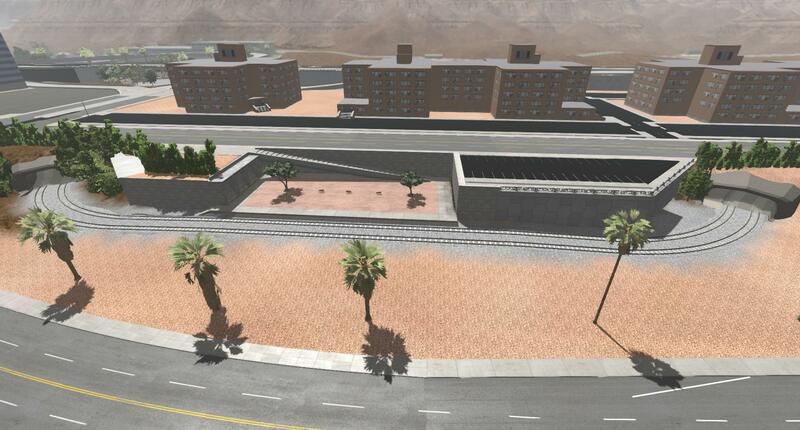 Schedule - again to clarify - current Patreons get this next beta of Los Injurus and very-possibly Nevada Interstate, too, this month. So there's TWO betas this month. Anyone who signs up before a beta release into the 10$ tier gets it, though, occasionally, I do release it for *all* Patrons, even the folks who only donate a dollar. Schedules are tentative, and not medically precise, exact, or otherwise set-in-stone, as goes working with a beta map and a pre-release game. This Los Injurus Patreon beta should come out sometime next-week, shooting for the 1st half of the week. Nevada will be out roughly 6~12 days after (max), that's leaning towards longer because stuff *always* comes up both in and outside of the game engine. --That is all for now, I'll have more pictures later and will be checking back every few hours to answer questions as I get to where I'm starved and must eat. Update! More stuff got done. 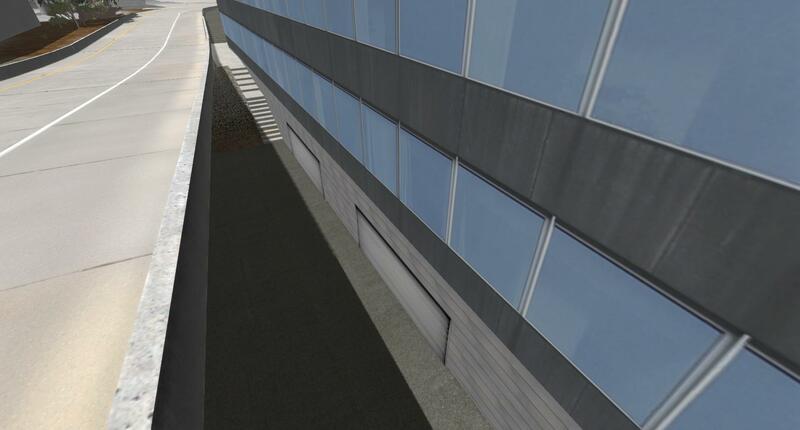 A mile or two of subway tunnel, with two stations was laid down! Again another editor shot - with the rail kit showing. 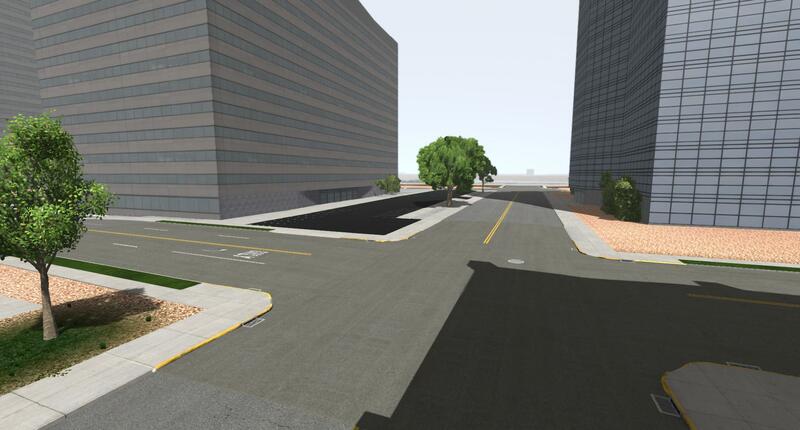 There will be some ramps hooking up to that level road-crossing, and that road will meet the two roads coming out from between the buildings further back in the shot. 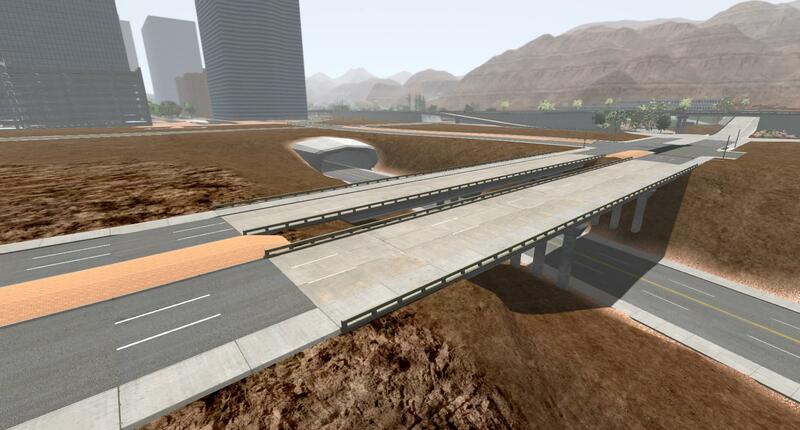 The plain grey ramp-road on the opposite side of the highway will also be re-graded and improved, as that's only temporary anyways. Several more buildings are in, more road is built coming down from the overpass just past the mid-rise buildings (before the TALL ones). This about where the tall buildings will end here on this side - most of the rest 'behind' the camera will be 5-floors or less. Going to try and fit a drainage ditch in the basin here (at the rail crossing here) at some point, possibly. Have to keep it interesting! More progress in that same spot. 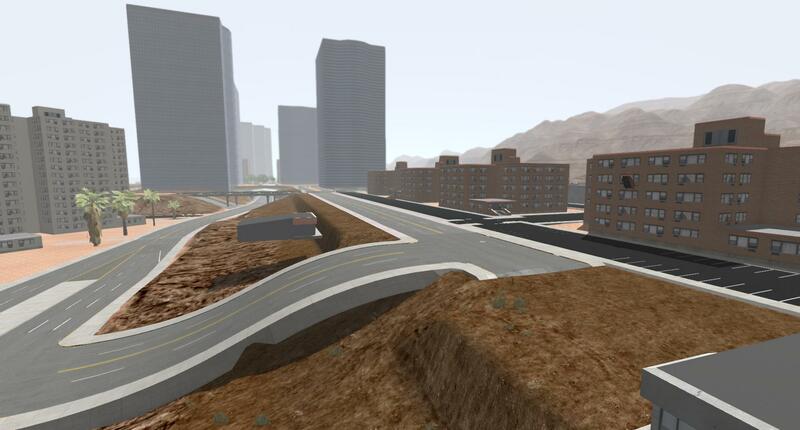 Got a bunch of roads put in & graded, the subway tunnel is fixed up, and a new spanned bridge support is created & in place. 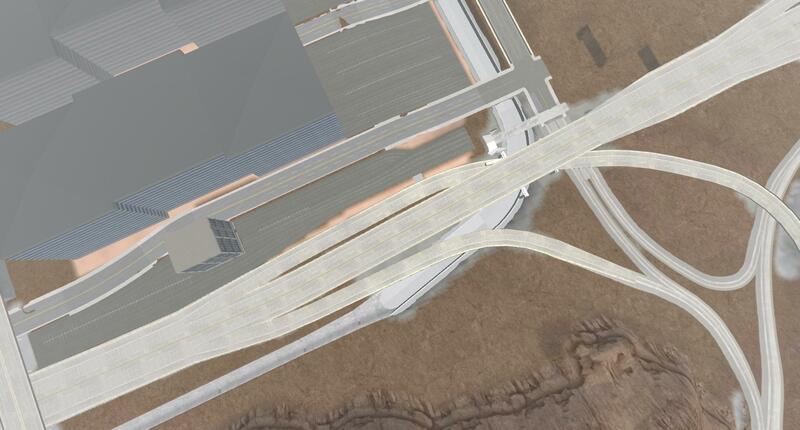 I would have to say, that this interchange is possibly the most complex, and challenging thing I've ever engineered in this game, never mind the new supports I had to make to hold up the highway overpass at the top (<1 hour time for making supports). Yes, a truck still fits under it with a good 12~16 inches to spare (one-third up to half a meter of clearance). It wouldn't be so bad, but the depression created by this road in the last shot that turns into exit/entrance ramps necessitated the need for drainage canals, as it IS the lowest spot locally. 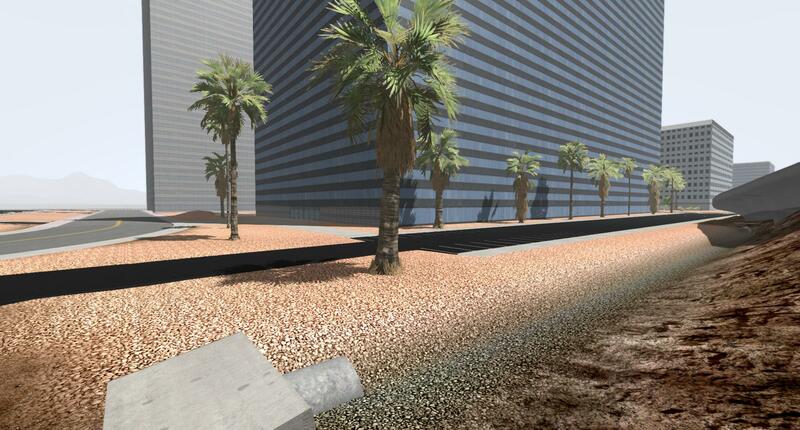 The drainage canal makes it believable. So entirely, lots of progress, I've spent over 6 hours on this intersection today alone, and several hours on it last night. What you see here took not less than 8~10 hours, disregarding time I spent building all the stuff that existed before (like the flyover route and the highway top-level itself). I didn't have much choice besides boring under the highway, but that's why the ramp was made with these objects when I first put it in. 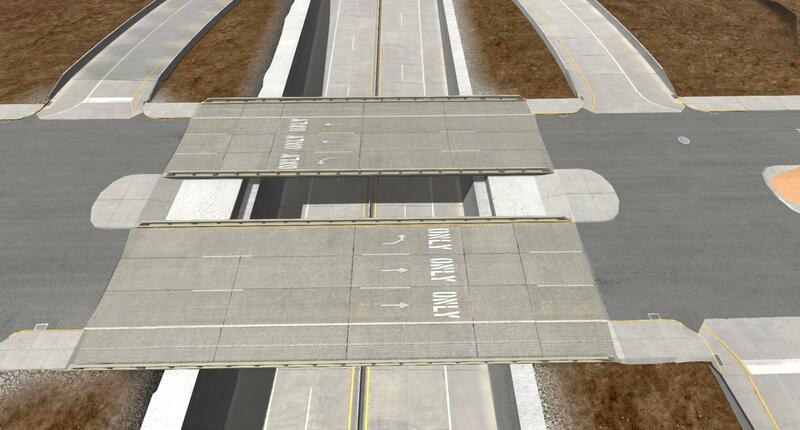 The ground-level on/off ramps are made of decal roads as usual, only the elevated ones are mesh objects, and the mesh objects at ground level start with the rail crossing. 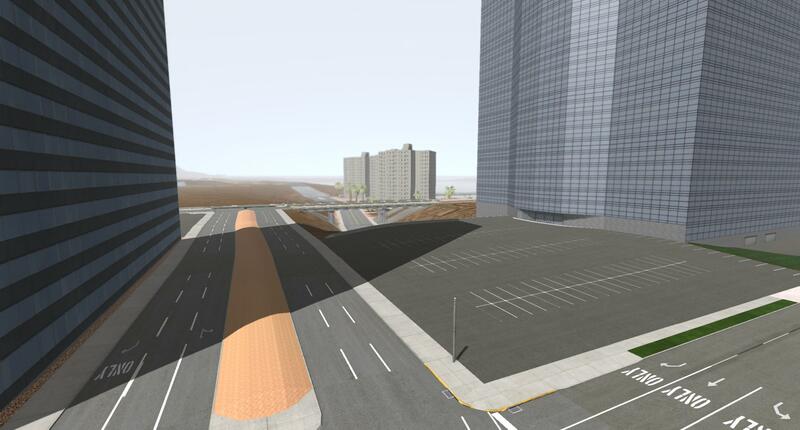 I wanted to get a certain amount of city in & done up to this highway exit, otherwise it would not seem very consistent. 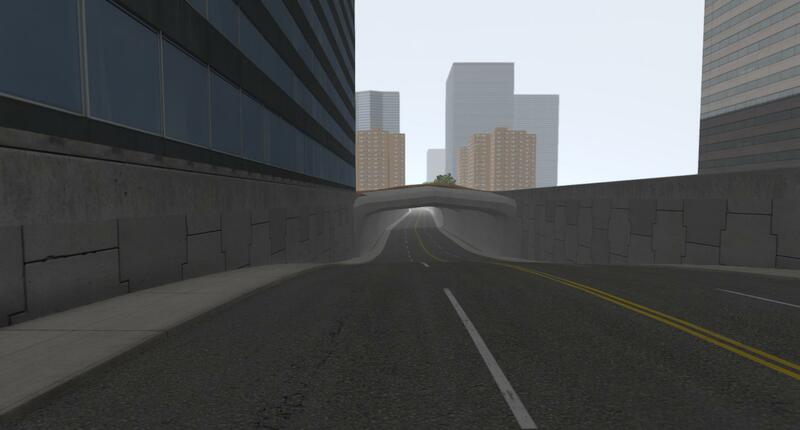 I will add a small ramp or utility bridge exiting the tunnel, so players can clear the gap in at-least one direction exiting the subway tunnel (why you must drive in there??? but you still can, regardless). 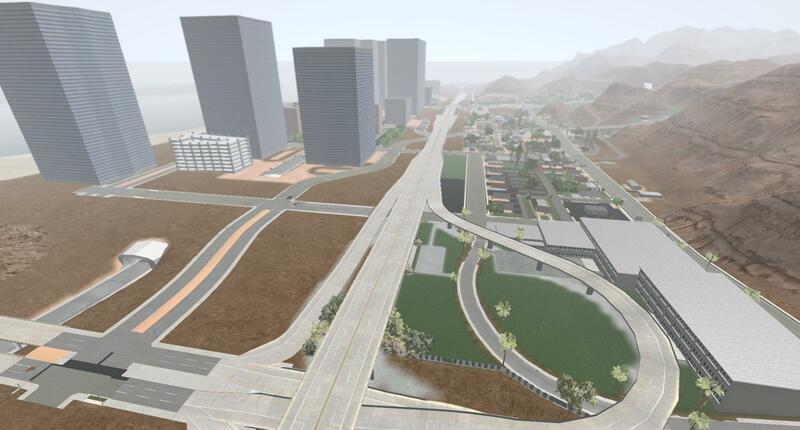 So yes, this should be pretty awesome when it's done, and the unfinished parts to the right of the canal (where the terrain harshly drops off to road level) will have strip-malls and such, low-density stuff. I just haven't smoothed that terrain out yet. Another unfinished area here... having a little fun testing it out. 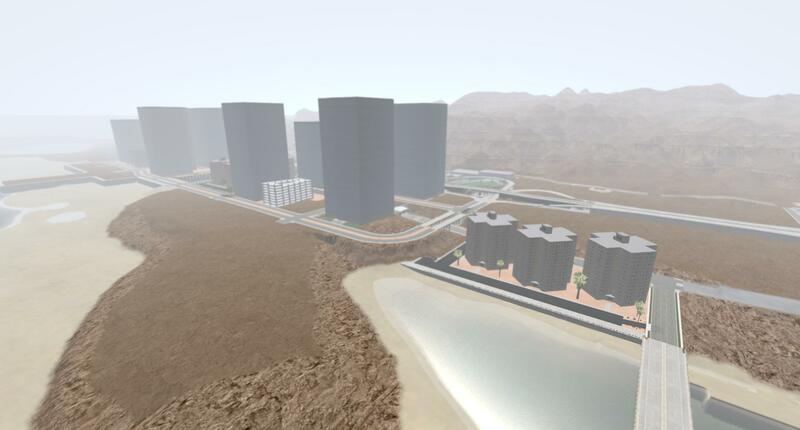 The narrow strip between the grade changes will have a few stores possibly, the floating buildings are for testing. Only got so far, the night is still a few hours from done, though, so no worries. 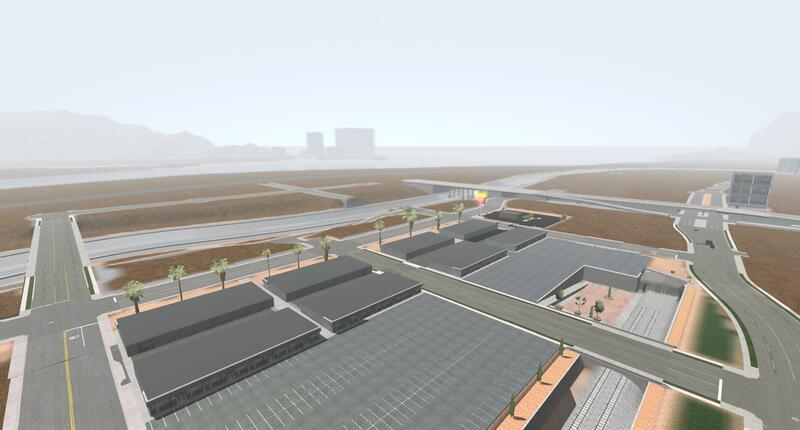 The lots still need parking space delineation, plants in the surrounding earth, and the typical odds & ends furnishing the lots, but progress is progress. A new sunken station (similar to the other, though the model is a little different as I didn't need such long retaining walls, or any walls on one side). The subway comes above-ground for a block or so here. 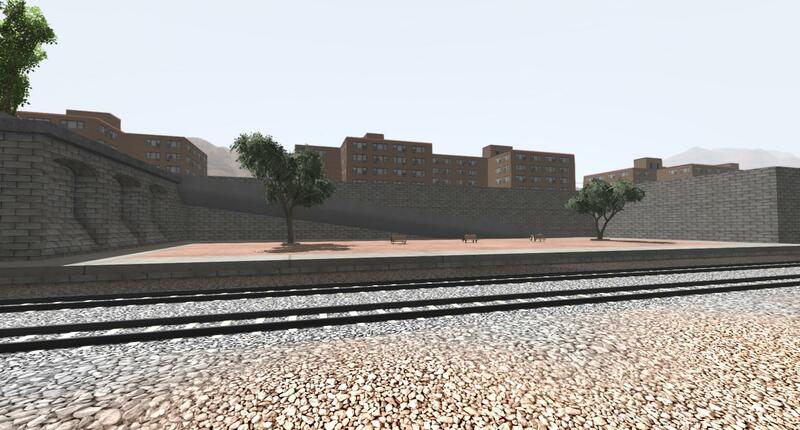 So, all in all, there will be roughly 1.3~1.5 miles of new subway / rail track in the next beta - it's not connected to the other stuff just yet, however.